(CNSNews.com) – President Trump’s decision to call off a planned summit with Kim Jong Un comes after heavy hints that China may have had something to do with the change in attitude and tone from Pyongyang, which recently resumed its customary U.S.-baiting rhetoric. Trump in a letter to Kim cited “the tremendous anger and open hostility” expressed in a regime statement that insulted Vice President Mike Pence and warned of a “nuclear-to-nuclear showdown” as an alternative to talks with the U.S. Speaking to reporters at a bill signing ceremony at the White House, Trump indicated that he had suspicions about what lay behind the shift in attitude by the regime. 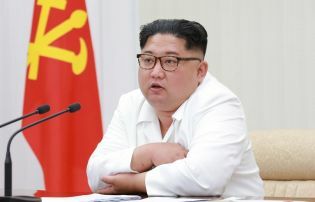 He suggested that Kim been keen for the summit until something – he did not say what – occurred recently to change that. Earlier, however, Trump suggested that China, and possibly issues relating to trade, may be to blame. In March – weeks after Trump first accepted his invitation for a summit – Kim paid his first visit abroad since becoming leader, traveling secretively to China for talks with President Xi Jinping. Then early this month, days after a historic DMZ meeting with South Korean President Moon Jae-in, Kim paid an unexpected second trip to China, again meeting with Xi, in the port city of Dalian. North Korea then began to raise doubts about the summit, and last Thursday Trump addressed the apparent hitch. “There has been a big difference since they had the second meeting with President Xi,” Trump said. Meeting with Moon at the White House earlier this week, Trump once again linked China to the souring, saying that “there was different attitude by the North Korean folks” after the second Kim-Xi meeting. China is North Korea’s closest ally and has long accounted for the vast majority of its foreign trade. Late last year Beijing began reducing its imports from North Korea, in line with U.N. sanctions resolutions in response Pyongyang’s ballistic missile threats. A White House official briefing on background later Thursday said North Koreans had committed, during Secretary of State Mike Pompeo’s visit to Pyongyang this month, to hold a summit planning meeting in Singapore last week. But though a U.S. delegation traveled to Singapore for the scheduled meeting the North Koreans never showed up, the official said. Moon was meeting with his top security officials Friday to discuss the summit cancelation, and was quoted by Seoul’s Yonhap news agency as appealing to Trump and Kim to talk directly in a bid to salvage the initiative. “Denuclearization of the Korean peninsula and the establishment of permanent peace are historic tasks that can neither be abandoned nor delayed,” the South Korean leader was quoted as saying. No Mr Trump. This one is on you. China has wanted the Korean peninsula to be united for a long time. Its better for China’s economy. I do agree Mr Trump coming from a point of strength is key. But when you get a dictator like Kim to budge, release prisoners, agree to dismantling nuclear capability, the last thing you should say is “Trust us”, when you continued to hold Naval war drills with SK in close proximity to NK.. Kinda makes you look disingenuous. How would that look to the North Koreans? Any leader is going to have to say something as in Kim’s own mind, there are people in the regime there that are looking for weakness from him and looking for strength. What your failing to understand Mr. Trump, this unifying the two nations NK, and SK was going to happen whether you talked to Kim or not. The Deep state tried to derail it and take a “sure win” out of your hands. They were already blaming you for derailing the summit meeting and that became “derailing ” a possible unification of Korea. . Never heard Kim say he wasn’t going to talk to SK at the summit… whether you cancelled “your” talk with Kim or not. Can we please stop making China the enemy?? How come when we accomplish “peace through military strength and presence” its noble and justified? When China does this, its panic city and the left’s anti-China anti-Russia agenda is furthered.